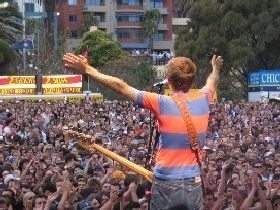 The St Kilda Festival in Melbourne is a popular community festival held in the summer month of February each year. Traditionally held on the second Sunday in February, the festival aims to showcase live Australian music talents, provide family and children's entertainment, beach activities and much more. The event is presented in a carnival atmosphere suitable for families and children of all ages. In 2010, it attracted around 400,000 people and the future promises to be even bigger and better than ever. The St Kilda Festival is one of Australia's best known and Melbourne's most loved carnival events. With St Kilda's stunning foreshore providing the backdrop and setting, festival goers are presented with the cream of Australia's musical talents all in one place. In 2011, the festival will be held over the period 5 - 13 February. Enjoy the warm atmosphere for an event which is a must see for all fans of Australian live music. BookToday has a great range of accommodation options for the St Kilda Festival in Melbourne. Be close to the action and excitement as Australia's favourite bands take to the stage. If you require further assistance with your booking, please call 1300 733 274 and speak with one of our friendly customer service assistants.